We thought that everything could be done in Excel. Basically the way it is, but the time costs for work in Excel is much higher when working in your program. Convenient system settings, and almost endless opportunities ... did this program a vital tool in our work. Alexander Pitkis, CEO in CSB Inc.
30-day free trial. Sign up in 60 seconds. Do you wish to quickly create forms, reports and complete business applications without programming? Do you want to create your own online database to share your data over your local network? Or are you looking for any reliable online source that can help you securely store, manage and share your database online? If so, then you are most welcome to Basemaster.com where you can finish your entire search. Basemaster is a leading and prominent online platform helping people to create online database easily and automate their business. Database is the backbone for any business. Any business that manages database efficiently will always be in a better position to serve its clients. A properly managed and maintained data helps employees of the firm understand and accumulate the important information and perform accordingly. Managing the data in files and having bulky dossiers does make the data fetching and accumulating process a bit lengthy and wastes valuable time. A business that can understand and fetch the data quickly will always be in a better position to serve its clients and people also love getting associated with such kind of business. Even managing data on computers can be problematic and is prone to losses. With the online database management you get the freedom to update and fetch data and can assemble all your critical business information at a central location. There are some trustworthy online database platforms for business users helping them in information management. 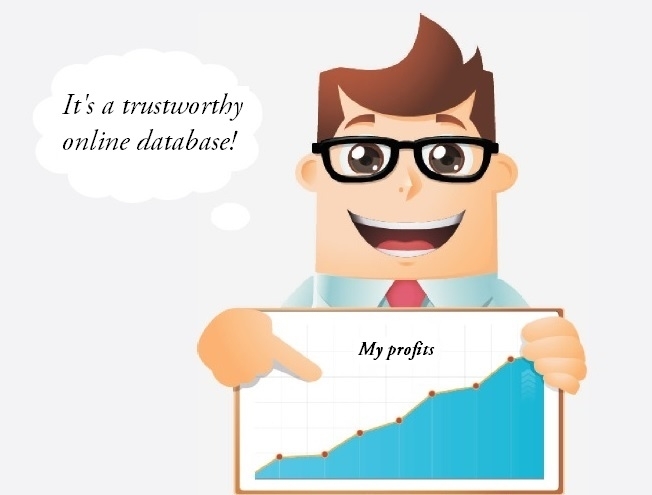 This platform is the best place to easily create online database for automating your business. The online database platform has database software which is very beneficial for small businesses as it helps them to grow big. The platform gives businesses the tools to easily manage projects, people, assets, tasks and many more facets of business. By using database software you do not have to worry about the outdated or expensive software or hardware and can use it to manage information and smoothly run business processes. With the powerful security options in the online database software you can control the accessibility of data to a group of employees or clients etcetera. The online database platform lets you build own database from scratch by adding tables /forms in a much efficient manner. You can have complete control over the database structure and can effortlessly create unlimited tables /forms and define triggers /actions. This database software can be easily used by anyone to tailor as per his/her needs as it is very flexible. So you can customize databases by yourself or can even ask for the technical support of the specialists at the online database platform. At the online database platform, with our user friendly tools you can create client database and manage your data the way you want. From group mailing to clients to managing documents, forms, generating reports etcetera, the database software is the right solution for you. With the help of online database software you instantly access all your data from one central location which will reduce your data entry time and allow you to create meaningful reports for your business. Create unified data base of clients, invoices, orders, tasks and other info. You don’t have a business-specific table? Copyright © 2015 Basemaster.com | All Rights Reserved.